The Fleur de Lys besides the Clock Tower in St Albans has just re-opened (June 2007) following a major refurbishment. 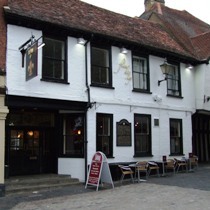 It is now part of the Snug Bar chain who also own pubs in Hertford and Cambridge. Fortunately the pub name was retained following the change of ownership. At the time of the review two ales were available; Banks and Taylor SOS and Woodforde Wherry. It appears that these real ales are essentially guest ales and change very regularly. Drinks prices are rather expensive with £3 being typical for a pint of beer. Good selection of wines and cocktails available. Food is served lunchtimes and evenings and the menu is quite varied ranging from snacks to main courses. Again, prices are a little expensive as a burger and chips will cost around £8. The interior is basically the same layout as it was prior to the refurbishment but everything has been modernised and smartened up. At the back of the pub there's quite a large patio which has bench style tables providing seating for around forty people. The clientel has changed since the refurbishment and typical drinkers are now in their mid-twenties upwards. At the time of the visit (midweek) the bar staff were good but the pub was fairly quiet. I guess there's lots of competition in the area with most bars now looking much smarter and trying to appeal to the same type of people.